From L to R: Physician Response Unit Medics James Lambert, Tony Joy and Nabeel Jemah. Patients are getting specialist emergency treatment quickly and avoiding trips to hospital thanks to an innovative service launched in East London. 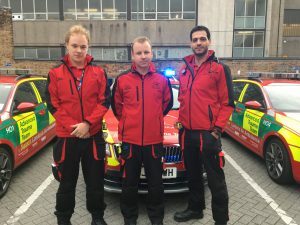 A review of the first 111 days of a unique collaboration between London’s Air Ambulance, Barts Health NHS Trust and London Ambulance Service’s remodelled Physician Response Unit (PRU) has revealed that emergency care is being transformed for patients in East London. By taking the emergency department on the road and to the patient, 67% of patients seen have been treated and discharged at home, allowing the patient to avoid hospital and began their recovery immediately in the community. 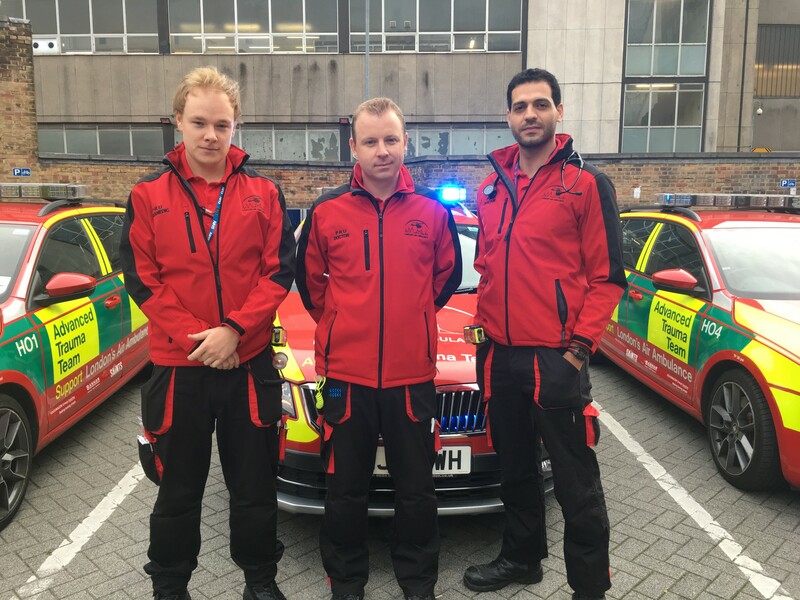 Staffed with a senior emergency doctor and ambulance crew member in the car, the clinical experience of the medics enables the PRU team to treat a wider range of illnesses and injuries at scene compared to ambulance crews, which take many emergency patients to hospital. Of 652 patients treated by the PRU during its first 111 days of extended service 449 patients were treated in the community. Of these 312 would otherwise have been taken to the emergency department at hospital. The PRU carries advanced medication, equipment and treatments usually only found in hospital, such as instant result blood tests, urine tests and sutures to stitch serious wounds. This means the PRU can treat patients where they are, avoiding a trip to East London’s hospitals. Patients have been overwhelmingly positive about being able to receive a specialist medical consultation in their own home, avoiding having to go to hospital. Alongside increased patient satisfaction, a better experience for patients and easing pressure on busy emergency departments, the service review has also identified significant savings for health services; £410,938 was saved in the first 111 days. Using average costs sourced from NHS Reference Costs 2015-16 (Department of Health) the review analyses the positive impact made in three areas; emergency department attendances (saving of £43,056), hospital admissions (saving of £294,250), and ambulance resources (saving of £73,632). The total saving across all three areas is approximately £410,938. Consultant in Emergency Medicine at Barts Health NHS Trust & Clinical Lead for the Physician Response Unit Dr Tony Joy said, “The data has confirmed what we hoped would happen when we gave the PRU the opportunity to operate for longer hours with closer working between all aspects of emergency healthcare provision. The first 111 days have brought tangible benefits to patients, who have been overwhelmingly positive in their feedback. It has also had real impact on local health services, with estimated savings of £410,938. We are turning emergency care on its head so that emergency patients are seen in the community by senior clinicians, enabling early treatment and access to alternative pathways without the need to go to hospital. The PRU is run as a partnership between London’s Air Ambulance charity, London Ambulance Service and Barts Health NHS Trust. London’s Air Ambulance provides the cars and some of the equipment. Barts Health NHS Trust provides the clinical governance, training, rest of the equipment and the senior doctor who works half the time in the Emergency Department of The Royal London Hospital and half the time with the PRU. London Ambulance Service provides the emergency ambulance crew and task the service from the 999 control centre in Bow.